Hiring process is one where the employers hunt for the right candidate for their business. Though there are various steps that are involved in picking the candidate, by the end employers are sure to recruit a skilled person for their organization. A hiring process is executed by allotting more of time and money, and so recruiters try to choose the best skilled candidates and make the hiring process a successful one. While hiring an employee, there are few principles and practices that need to be followed in order to recruit employees. 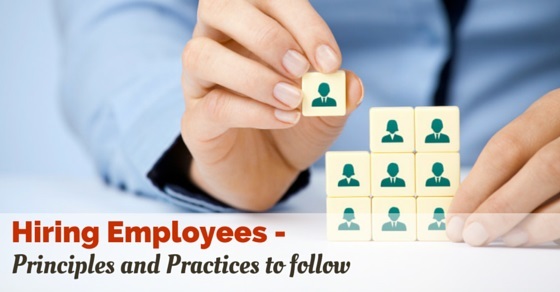 Mentioned here are a few principles as well as practices that help in hiring employees. For any recruitment process the strategy should be clearly defined and the message should be prominent enough that it reaches the audience. All details such as the reason, requirement, when and where should be communicated well. Weak candidates would be hired and resources can go for a waste when there isn’t a well-defined strategy. The strategies should also be flexible to changes such as economy is, it is considered as best one. When hiring is planned, it would be good if the process is made continuous by developing a stream of candidates for approaching. Techniques such as planning, onboarding, sourcing and branding can be followed so that a talent stream of candidates are flowing in. Hiring strategies and principles are always compared with other competitors as competitors are ones who always copy the principles and approaches from your side hence making a comparison is never a fault. When an external image is developed for the organization which opens up that the organization is an excellent place to work in, then a long term recruitment principle is obtained. By this way applicant’s research, as they hear, see and get to know the factors about the organization. The number of applicants in this manner for recruitment is enhanced. The hiring process or principle should be made wide and visible as the talents may be present from any distance across the globe. There may be talents who are also willing to work from abroad remotely, the principles can also consider this strategy and include the same in their process. The hiring process should be aimed at employees who are talented and top employers employed in top organizations. The strategy needs to be picking and convincing those skilled employees in your competitor’s organization who are not looking for a job. The hiring decisions should be made quickly and fast as the demand for skilled candidates elevates. A recent research has also opened up that top talents are grabbed away from the market by the time corporates decide and make a decision. To catch hold of top performers, effective sources should be used which result in a quality hire. With the number of sources employee referral is considered as the most active source. Professional events, off campus, and contests are other resources that aren’t much effective and is a waste of time and money which in turn results in weak hires. So using the right source for hiring is mandatory. Hiring in all aspects has enhanced where in some organizations managers, higher employees and supervisors are rewarded for contributing and helping in hiring process. It is good to offer importance to hiring procedures by providing rewards. This can be well accomplished by convincing the higher officials and HR. Apart from principles in hiring there are also a few procedures that are to be followed for any hiring process. A few procedures that are to be followed during a hiring process are mentioned below. The procedure usually includes reviewing the applications, testing, picking the right candidate, and making the hiring decision. Automated resume screening and search is a beneficial aspect which is to be adopted by most organizations these days. This process is simple and easy to find, bring together resumes in the required manner. Computer assisted interviewing is also another method which is adopted by nearly 12% of the employees. Each application is assessed and the candidate who possesses the right skill, experience and educations and other requirements for the job are picked out. The next step after selecting the right candidate for job is testing the candidate. For this process the candidate is called for an interview and tested if the candidate possesses the skill, talent and knowledge required for the position. Hiring is another procedure where the hiring department conducts reference checks before employment. Employee’s performance records are checked during a reference check. Every organization would have their set of procedures for checking in that aspect the pre-employment check is conducted and the candidate is ticked clear if the check is successful. Once the employment offer is accepted by the candidate, it is the responsibility of the department to send an offer letter. The letter should carry all details such as date of joining, salary, back ground testing requirements and other mandatory rules. These are a few procedures and principles which can assist you in systematizing your hiring process. The human resource department takes responsibility for hiring and assist at times of recruitment. The hiring process should be keen on qualification based recruitment, diversity, job relatedness and non-discrimination. Knowledge, qualification, abilities and skills are few factors which are expected by the employers. Hiring has become a critical task these days with the present economic conditions. In that aspect the entrepreneurs aren’t ready to waste time on bad hiring choice. In that manner a standard principle and procedure should be maintained in order to make the hiring process a quality one and pick the right candidate for recruitment. Purple Squirrels: How to Find and Recruit Them Easily? How to Attract Freelancers with an Irresistible Job offer?